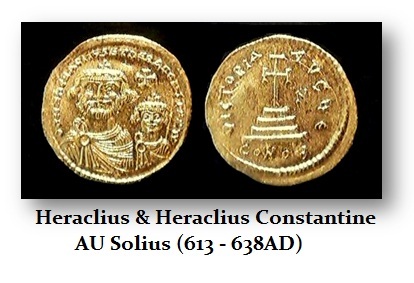 Heraclius was born around 575AD and became emperor in 610 ruling until February 11, 641AD. It was Heraclius who actually mad Greek the official Eastern Roman Empire’s language. His rise to power actually began in 608AD, when he and his father, Heraclius the Elder, who was the exarch of Africa, led a revolt against the unpopular usurper Phocas who would be destined to be regarded as one of the greatest Byzantine emperors. At the time of the Revolt of the Heraclii, the Byzantine Empire was threatened on every frontier. The Persians had risen and occupied most of Asia Minor (modern Turkey) as well as Syria and Egypt. The Persian capture Jerusalem and took the Holy Cross of Christ off to their capital in Ctesiphon to deliberately suppress Christianity. To the north of Constantinople, the Slavs and Avars took most of the Balkans and ventured into Greece moving even into the Peloponnese and many Greek Islands. When Heraclius came to power, the Byzantine Empire was near disintegration. Heraclius then took charge of the Byzantine–Sasanian War of 602–628AD. The first battles of the campaign ended in defeat for the Byzantines. Nonetheless, the Persian army made their way to the Bosphorus stood at the walls of Constantinople itself. But the city was protected by impenetrable walls and a strong navy. Eventually, the walls would fall only when the canon was invented. The great walls of Constantinople enabled Heraclius to avoid total defeat. Soon after, Heraclius first restructured the economy reorganizing the government. He granted land to soldiers on the condition of hereditary mandatory military service. In this manner, he created an incentive t6o defend the Empire. His reorganization rebuilt and strengthen the military using Adam Smith’s Invisible Hand – self-interest. Heraclius drove the Persians out of Asia Minor and pushed deep into their territory. He managed to defeat the Persians decisively in 627 at the Battle of Nineveh. The Persian king Khosrau II was overthrown and executed by his son Kavadh II. Only then did the Persians sue for a peace treaty, agreeing to withdraw from all occupied territory. Heraclius soon experienced the rise of Islam. It was during his reign that the Muslim conquests began. Emerging from the Arabian Peninsula, the Muslims quickly conquered the Sasanian Empire. In 634AD the Muslims marched into Roman Syria, defeating Heraclius’s brother Theodore. Within a short period of time, the Arabs conquered Mesopotamia, Armenia as well as Egypt. It was Heraclius who attempted to solve the schism in Christianity between the Monophysites and the Monothelitism. The schism between these two religious philosophies led to many deaths. The Monophysites held that in the person of Jesus Christ there is only one nature (wholly divine or only subordinately human), not two. Monothelitism (meaning “doctrine of one will”) is a particular teaching about how the divine and human relate in the person of Jesus. is the view that Jesus Christ has two natures but only one will. That is contrary to the Christology that Jesus Christ has two wills (human and divine) that correspond to his two natures (dyothelitism). Monothelitism is a development of the Neo-Chalcedonian position in the Christological debates which began in Syria. It emerged during 638 and became quite popular. In essence, Monothelitism was the belief that Christ is known as “both fully human and fully Divine, one in being with the Father”, which was in contrast to the position of the Monophysites who held that Christ possessed one nature only. Eventually, Monothelitism was rejected and denounced as heretical in 681AD, at the Third Council of Constantinople. Eventually, Heraclius’s project of unity was rejected by all sides of the dispute. Heraclius did manage to establish diplomatic relations with the Croats and Serbs in the Balkans to end those disputes.